The Biggest Design Challenge Ever - CMA Fest! I've had plenty people ask me how something like this happened. Sounds crazy, I know. Well, it all kinda went down something like this ..... (let me set the mood for you) ... It was one of those sunny spring days ... you know the kind ... where you feel like you're driving down a dirt road, radio blasting, windows rolled down, wind blowing through your hair - isn't there a country song about that? I open my email and find a message from my good friend, Rachel Hardage Barrett at Country Living magazine. Rachel fills me in on a styling project that she thinks I may want to be involved in. From the message it appears that the project is a bit more than your typical styling gig ... actually it was a bit more than ANY styling gig ever! Rachel writes that the CMA World folks are looking for someone to transform the Titans locker room into a lounge-y hangout pad for the upcoming CMA Fest artists! Whew!!! The girl really knows how to throw something at ya! And, that's not all ... they also need the dressing rooms restyled to look a little more swanky than sweaty! Oh geez ... really ... that's all? On any given day I probably would have told Rachel that she had finally lost her mind, and just because we were from the same small town in West Tennessee it didn't actually mean that the "muddy water of the Mississippi was thicker than blood" (as she wrote in the foreward of my new book, City Farmhouse Style). But ... since I had a very bad case of spring fever and was clearly out of my head that day, I went for it. Now, usually I would start out with a before picture so that you could get an idea of how the space looked before the design. But, because those pictures are sooooo bad, I just couldn't bare to have that be the first thing staring at you in this post. So, in this case I'm saving the worst for last. Here's all the deets on how we kicked the Titans out of their locker room (just kidding), to make it all fancy for the CMA Fest artists. We had to make a pretty good game plan to overcome our two biggest design challenges. The first was the ugly office type cubby lockers that line the walls in this space. Since we couldn't magically make them disappear, we opted for the next best thing - we covered them with a luxurious dark blue velvet drape. The second and perhaps the most challenging of the two was the bright red and blue wall to wall carpet that covered every room!! That's when we called on our favorite rug guy, Essy's Rug Gallery in Franklin to provide some really cool antique over dyed rugs that we could layer throughout the space. 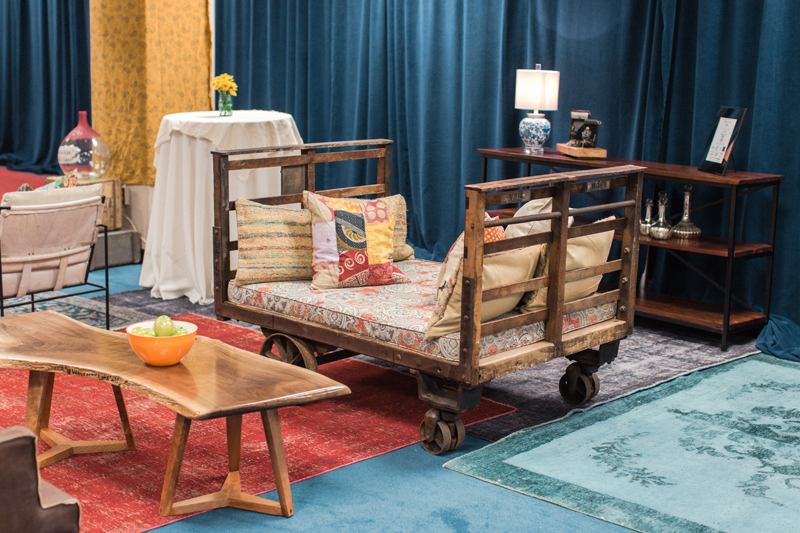 We really wanted the green room to feel kinda home-y lounge-y (does that make sense?). As an anchor furniture piece we fell in love with the Mitchell Gold sectional that we found at Mitchell Gold + Bob Williams in Green Hills. It was velvety and comfy and worked really well with the drapes. Back in Franklin at J. J. Ashley's, we picked up some awesome white hide sling chairs (very swanky) and those smokey mirrored side tables provided a lounge-y vibe. We doubled up on seating and table surface with an iron and wood slab table that also served as a console style piece behind the sofa. 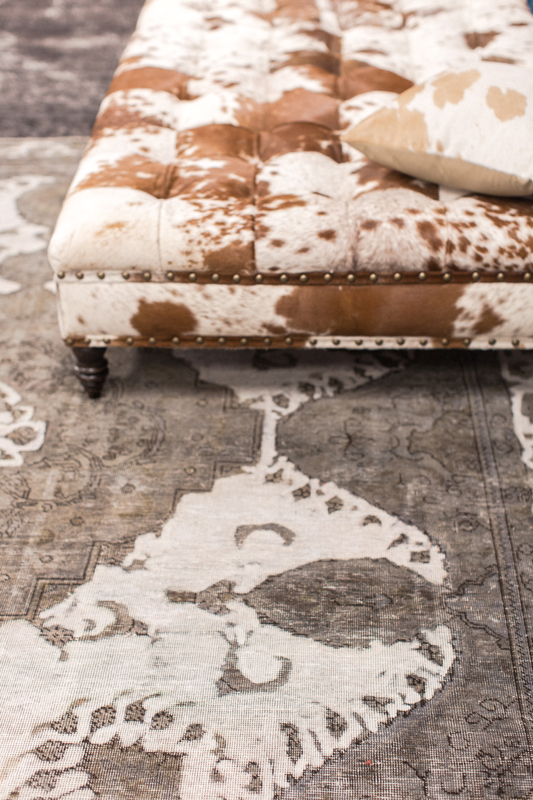 We were totally crushing over this oversized cowhide ottoman at J. J. Ashley's and while we weren't exactly sure where we could use it in the scheme of things we were determined to make it fit. At Merridian Home Furnishings in Nashville we snagged these awesome paper lanterns to pull together a little hangout spot and photo opt for the artists. I love how the pattern in the ottoman and the pattern in the rug came together in a fun funky way. The blend of the old with the new gave the space a storied vibe. 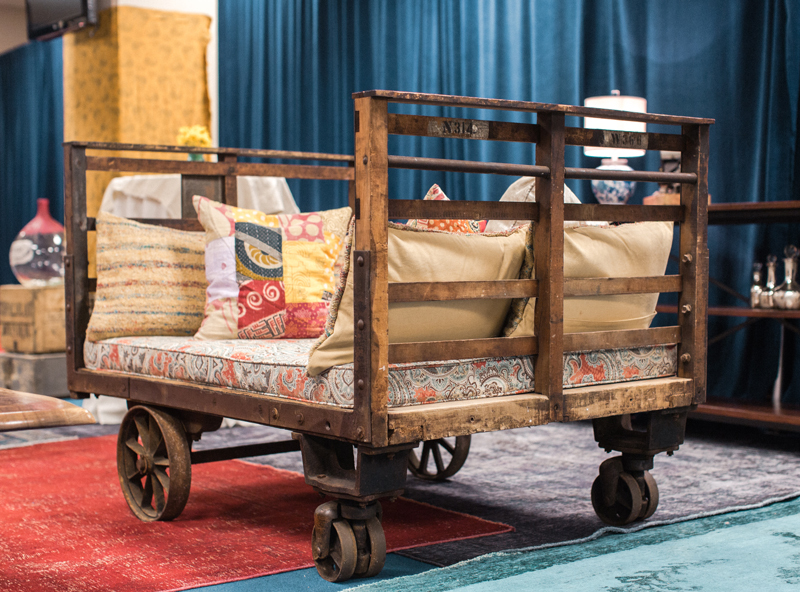 A vintage factory cart turned love seat (found at CR-71) worked well with the handcrafted black walnut coffee table that was made by one of the artists who performed in the band McCoy. Evan Galante handcrafted this gorgeous coffee table, and when we saw it we knew we had to have it for the space. Because we wanted the space to have a lived in vibe we added a couple of metal and wood console shelves to hold a pair of vintage cameras from Scarlett Scales Antiques and a very cool pair of modern style lamps from Merridian. To break the feel of being wrapped in a blanket from all that velvet drapery we came up with the clever idea to create an inexpensive art installation that would hang over a few sections of the fabric. Because we couldn't actually attach anything heavy to the pipe we opted for something lightweight - like rolls of kitchen papers that we found at Hester & Cook. 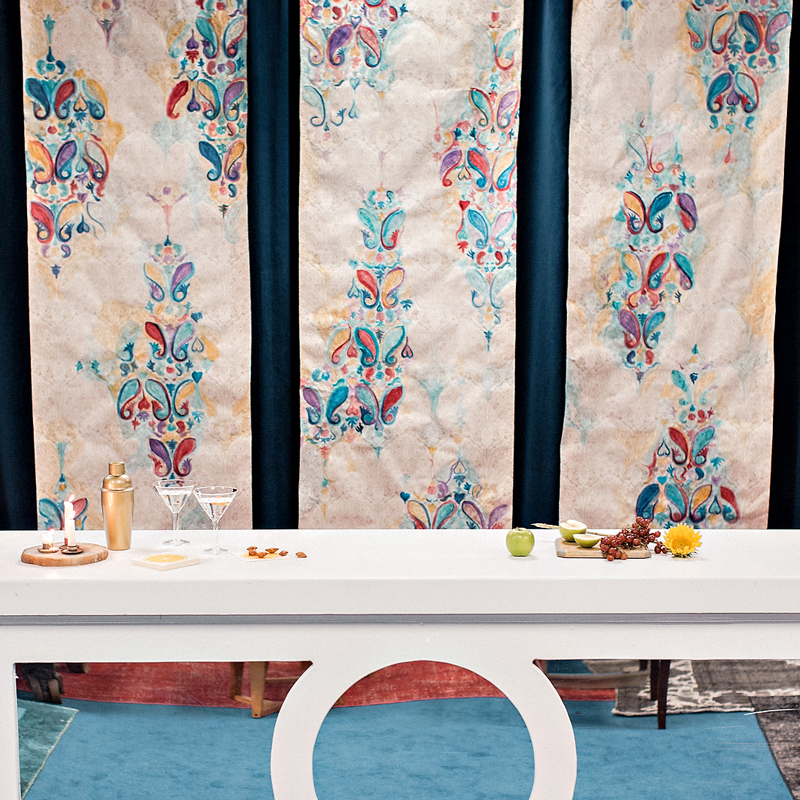 These rolls of paper are typically used as table runners but we love how they have a wallpaper look without all the weight. The paper was printed in a pretty paisley pattern but we had Erin Anderson, at erin's art and gardens, embellish the design with watercolor paintings. 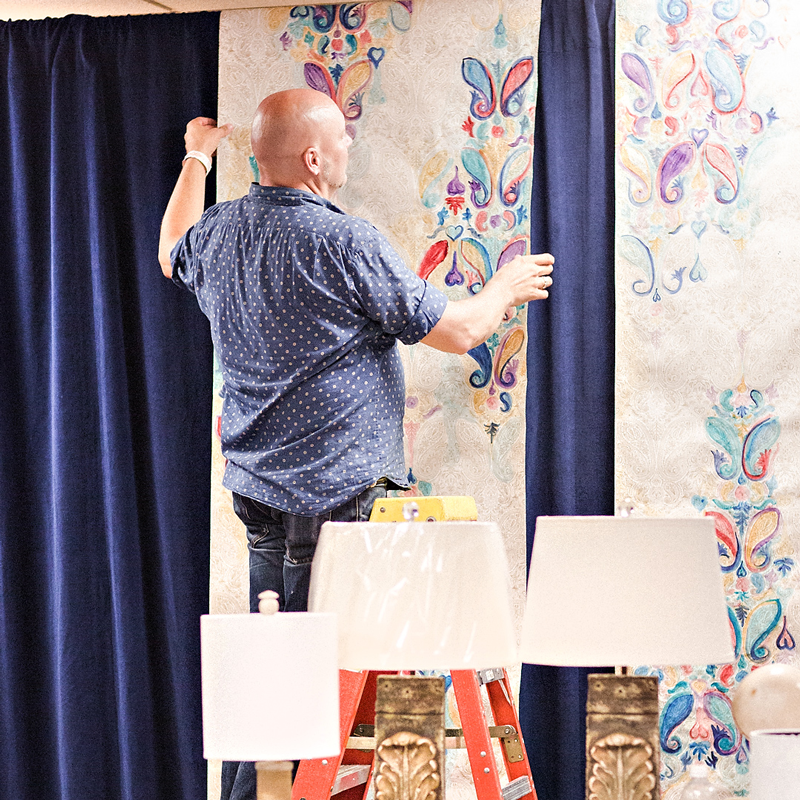 Since the installation was paper, we simply draped it over the fabric panels. We love how this added a pop of color, texture, and style to the space. When you are asked to flip a space that is designed to accommodate jockstraps and smelly socks into a sweet little set-up for CMA Fest co-host, Kelsea Ballerini, what's a designer to do ... short of throwing in the towel? 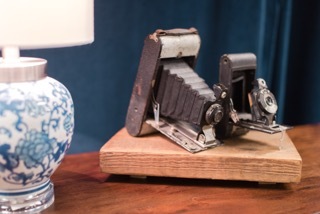 Infuse it with vintage decor, of course! We knew we would find something funky and feminine at CR-71 and this sofa was perfect for creating a vibe for a young country music star. 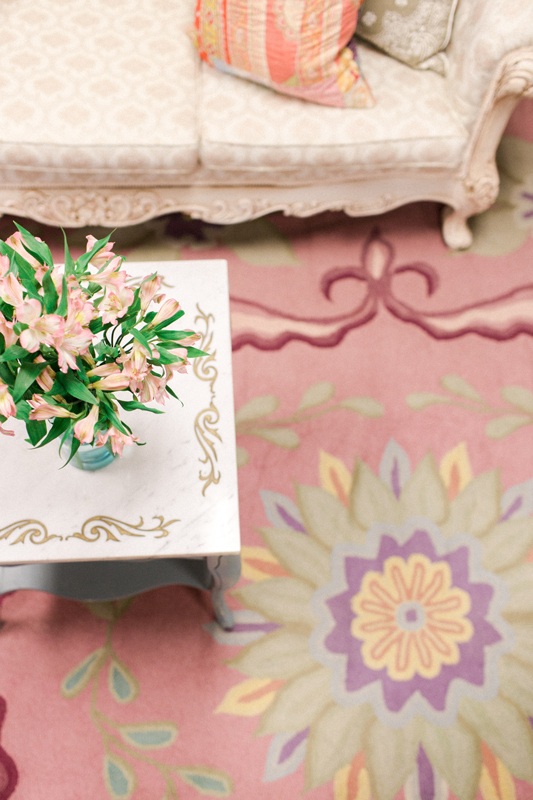 We think the 100 year old American folk art flower power rug from the Persian Rug Gallery pulled it all together. 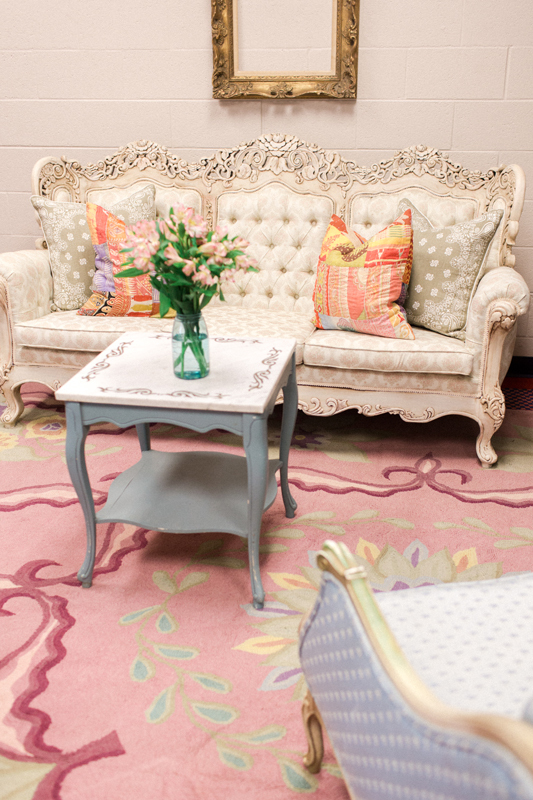 The inspiration for this dressing room was clearly the Boho pillows. 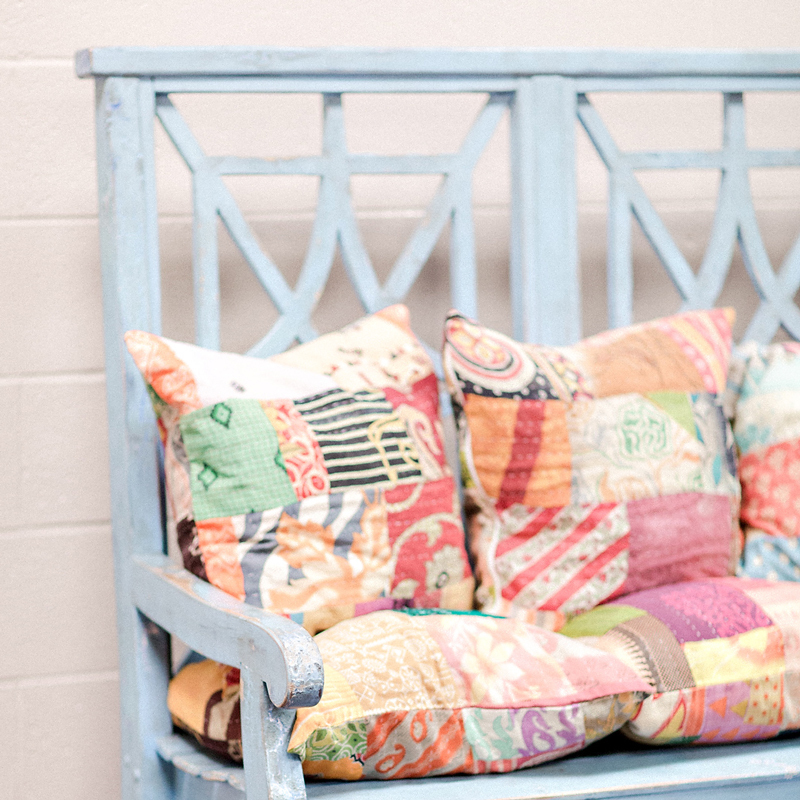 We fell head over heels in love and decided these brightly colored accessories made from old quilts would be the focal point instead of the furnishings. 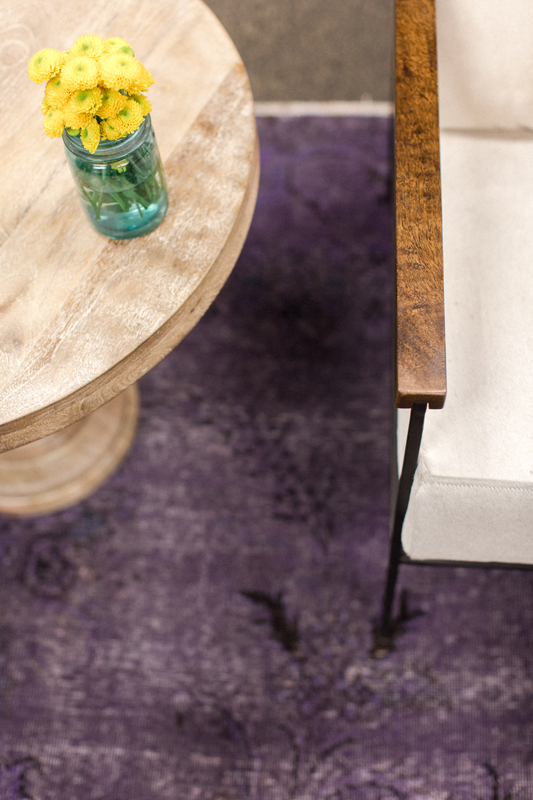 Pairing it all with a room sized antique over-dyed purple rug gave the space the unconventional look we were going for. And, now the worst for last! This is the before photo of the green room!! Do y'all think we pulled it off with style?